Following his first wife's death Aiken married his longtime administrative assistant Lola Pierotti in 1967. He wrote an open letter to the Republican National Committee in 1937 criticizing the party and claimed Abraham Lincoln "would be ashamed of his party's leadership today" during a 1938 Lincoln Day address. He publiGeorge Aikend Pioneering With Wildflowers in 1933 and Pioneering With Fruits and Berries in 1936. George David Aiken (August 20 1892 – November 19 1984) was an American farmer and politician. 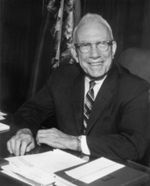 At the time of his retirement he was the most senior member of the Senate.